Our collection of Goodyear-welted women’s shoes combines traditional designs with classic cuts, stylish and elegant colour combinations, and extraordinary kinds of leather. The result: one-of-a-kind premium footwear. SHOEPASSION.com takes a clear stance against the dictates of fashion trends, focusing instead upon timeless classics and a high degree of wearing comfort. Goodyear-welted, full-leather shoes are a rarity when it comes to women’s footwear. The models in our collection boast comfortable footbeds, high breathability, and stable forms. Our comprehensive women’s shoe collection is supplemented by the lightweight models in our »Italian Line«. 100% made in Tuscany, these covetable, dreamy shoes impress with dynamic designs, quality leathers, and meticulous, detail-oriented Italian construction. Oftentimes women’s shoes are restricted to playful designs and current fashion trends, whereas men’s shoes are created with comfort level, classic looks, and functionality in mind. SHOEPASSION.com flouts short-lived fashion trends. A far cry from passing fancies, our women’s shoes combine timelessly elegant traditional styles with high standards of quality. Our collection of sophisticated women’s shoes includes cherished classics such as the Oxford, Derby, and loafer in fresh guises. From our sporty and elegant flat-heeled »trotteurs« to their elevated counterparts, our Goodyear-welted models guarantee a stylish appearance at virtually every occasion. Refined cuts, exotic leather uppers, and striking colours and patterns round out our varied footwear repertory. Originally created for men in the 1800s, Derby and Oxford shoes entered women’s wardrobes at the turn of the 20th century. Practical women’s lace-up shoes with a mid-height heel, also known as trotteurs, lent their wearer a sure and self-confident appearance. Today these classic shoes are an indispensable part of elegant women’s footwear. Highly comfortable to wear, they are suitable for the workplace, business meetings, and relaxed walks around the city. Fans of striking buckles will enjoy our double monk. Similar to the Derby shoe in terms of shaft cut, our double monk features a truly striking double buckle closure. Our take on the most famous slip-on shoe in the world—the penny loafer—provides a light and summery look. This classic American shoe does not feature any lacing or buckles, and is easy to combine with many different kinds of outfits. Those who favour a touch of extravagance will find inspiration in our two-toned models. These elegant women’s lace-up shoes exude 1930s flair, and are widely known as »co-Respondent Shoes« or »spectators«. White deerskin that is supple to the touch and nubbly leather taken from the largest flightless bird in the world transform our classic shoes and boots into dreamily exotic footwear. Speaking of boots: in addition to stylish, elegant low-rise shoes and heels our collection of Goodyear-welted women’s shoes also includes models with a high-reaching shaft. Our takes on classic British shoes such as the Chelsea Boot, Jodhpur, and George Boot boast feminine lasts and striking shaft cuts. Our knee-high boots ensure comfort even in the most unfavourable weather. Goodyear welting lies at the heart of our elegant women’s shoe collection. Considered the supreme shoe production method, this centuries-old traditional handicraft achieves breathtaking results. Flawlessly processed premium materials ensure a high degree of wearing comfort, extreme durability, and uncomplicated, inexpensive repair. Designed in Berlin, our shoes are assembled in our factory in southern Spain. A typical Goodyear-welted women’s shoe from our collection consists of about 65 individual parts. Assembling each shoe requires roughly 210 steps of traditional nest manufacturing. 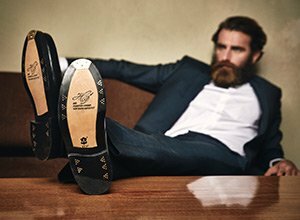 Expert craftsmen work with first-class materials to guarantee the outstanding quality of our shoes. Dynamic, elegant designs, premium leather, and incomparable wearing comfort define the models in our »Italian Line«. Featuring lightweight yet durable construction, these shoes are products of the finest Italian handicraft. Discover the extraordinary quality of our chic loafers, stylish moccasins, and classic ballet pumps.